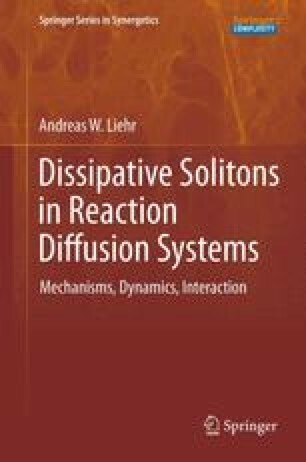 The chapter introduces the topic of structure formation, and gives a literature survey to reaction-diffusion systems. It closes with a short guideline how to read the book. “I’ll do even more than you ask,” replied the hyena. “I’ll take you to the fruit!” Seizing the tortoise between his strong teeth, he jumped up into the tree and put the tortoise down in a fork of branches high above the ground. Then he leaped down again, laughing diabolically at the tortoise’s plight before disappearing into the jungle. Afraid to move, clinging to the branch, the tortoise stayed up there for hours, while the sun slowly dipped over to the west, lengthening the shadow of the tree. Every time he looked down at the ground far below, he felt dizzy and terrified, but he had to keep his eyes open for he knew that help wouldn’t come from the skies. At last, with darkness falling and despair growing, the tortoise saw a leopard padding past the tree and cried for help. The leopard leaped gracefully into the tree and brought the frightened tortoise back to the ground. At his request the leopard shook the branches so that the fruit fell to the ground for the tortoise to eat. A fairy tale of the Bantu speaking people of Africa. Retold after a version known from the South African tribes Zulu, Xhosa, Basuto, Bechuana, Herero, and Shangaan [1.1].